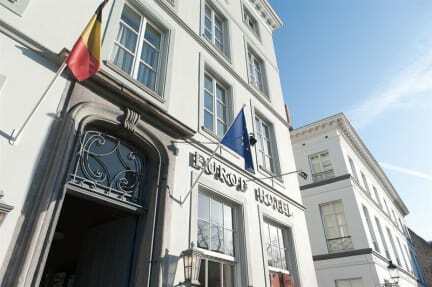 Europ Hotel Brugge i Brugge, Belgien: Reservér nu! Hotel Europ provides individually decorated rooms for a romantic escape, weekend trips or family stay in a historical Centre of fairy city Brugge. Hotel is located close to all historical places, in a peaceful canal side. We offer well equipped, spacious rooms with continental breakfast. 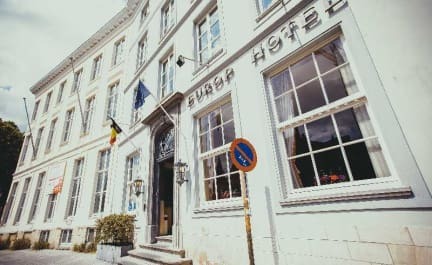 This family-run hotel benefits from a peaceful canal-side location in the heart of Bruges, only 500 metres from the Grote Markt. Europ has a cosy bar which serves local beer and has original features including wooden beams. Each of the simply-furnished rooms at Europ Hotel has a work desk and cable TV. The private bathroom has a shower and hairdryer. Some of the rooms have a bath. Musea Brugge is 15 minutes’ walk from Hotel Europ. The Halve Maan Brewery and Beguinage are 1.5 km away. The historic centre of Gent is less than 50 minutes away by car.